THE ROMANY LIFE: Thermal Cooking Is PERFECT For RVers-Try This Easy Recipe Too! 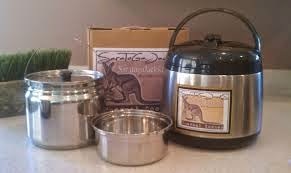 Thermal Cooking Is PERFECT For RVers-Try This Easy Recipe Too! I am very late-to-the-game on this one. Between reading blogs, magazine articles and our 20+ years of experience, we have gathered a good many ideas that work well. Some things sound good, but upon putting them into practice, weren't really all that great. Then there are those that you try and say, "Where have you been all of my life!" Thermal cooking is one of those cool things that I have really started to have a big affection for. Thermal cooking basically relies on using the principle of trapping existing heat in an air-tight, leak-proof vessel, and allowing it to continue cooking after initial application of traditional heat (like on your stove top) and bringing it to a rolling boil for several minutes. You then place the cooking pot inside of a thermal container and seal it and don't touch it for 6-8 hours (depending on the cooking apparatus you are using). Because the thermal container is air-tight and well insulated, the heat is trapped inside and it continues to cook the contents, like a slow cooker, but without using any further energy, like electricity or gas. Why is this so wonderful? Well, let me tell you! First, let's talk about the use of energy, in the form of your stove top or a slow-cooker or an oven. All of these require electricity or propane. If you are in a site with hookups, the electricity is probably not a concern, if you are not planning on going anywhere, but leaving an appliance running while you are gone and (at least in the summer) heating up the rig might be distasteful to you, it is to me. When it's hot, anything producing heat inside of the RV is NOT a good thing! The air conditioner works hard enough as it is, sometimes. If you are planning on being underway to another destination, it's an outstanding way to throw something in the thermal cooker when you leave and then dinner is ready after you get setup at your new destination and you may not feel excited about a lengthy meal preparation. I typically put the meal in the cooker and set it in the sink to keep it from travelling anywhere during the trip. It works exceptionally well. The outside of the cooker stays cool-to-the-touch, so it's no problem if you need to carry it around or move it at anytime, in fact, it's a great picnic vehicle! Most come with a carry handle on top for this reason. Travelling with it is encouraged. For some reason, these little suckers are spendy, at least I think so. You will fork over between $60-$180 for one of them. That's a lot in my book for what is essentially a large thermos with a steel pot inside. No matter though, you will hopefully be as pleased with it as I am. I advise you to go ahead and get the best one available because it is important that it seal properly and that the materials are of high quality. I own a "Saratoga Jacks" brand in the 5.5 L but I would really like one that is smaller. It is essential that the pot inside be FULL when you put it in the thermal container, or it will cool off too fast. Often, I don't want to make 5.5 liters of something. I would like to make, say, 4 liters. So, I am shopping for something smaller. One of my favorite recipes so far is one that I created myself. It is a sort of Jambalya using readily available and easily stored ingredients that you can have on hand for longer periods of time (like travelling and boondocking). It is a Cajun-style recipe and you can adjust the heat to suit your taste. I like recipes that have simple, common ingredients that we can pick up at Wal-Mark or the like. Saute onion and peppers for a couple of minutes in 2 Tbsp olive oil. Add remaining ingredients and water according to package directions. I find it best to reduce the water by about 25% or your dish will be a little saucy. The thermal cooker doesn't allow steam to escape. Bring to a hard boil for 4 minutes and then put cooking pot into thermal container and seal according to manufacturer instructions. This dish could easily be eaten after only an hour or two, but will hold for 8 hours. It's delicious and if you have a freezer for the sausage and shrimp you can easily have the ingredients on hand for long periods of time.